Hardin Library for the Health Sciences now has a site license for the Medical Letter at http://purl.lib.uiowa.edu/MedLetter. 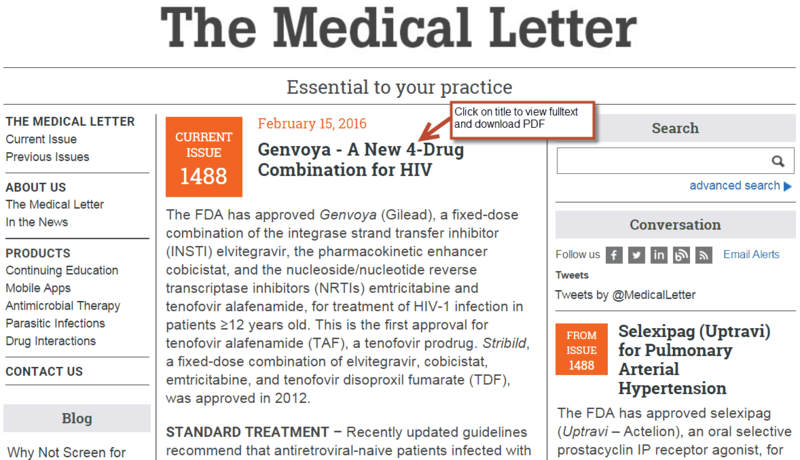 Medical Letter can also be found on the Health Sciences Resources A-Z http://guides.lib.uiowa.edu/az.php . 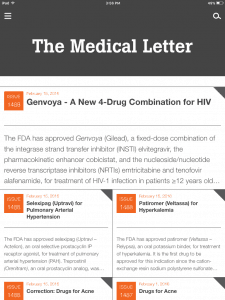 The Medical Letter’s home page shows the current issue of The Medical Letter on Drugs and Therapeutics. To view full text articles and to find the Download PDF link, click on the title of the article. Use the navigation links on the left side of the screen to access other contents, including previous issues, continue education (CME/CE), Drugs for Parasitic Infections, and The Handbook of Antimicrobial Therapy. Note that the library also has print copies of the Medical Letter on Drugs and Therapeutics, Drugs for Parasitic Infections, and Handbook of Antimicrobial Therapy. Search InfoHawk Catalog for more information. 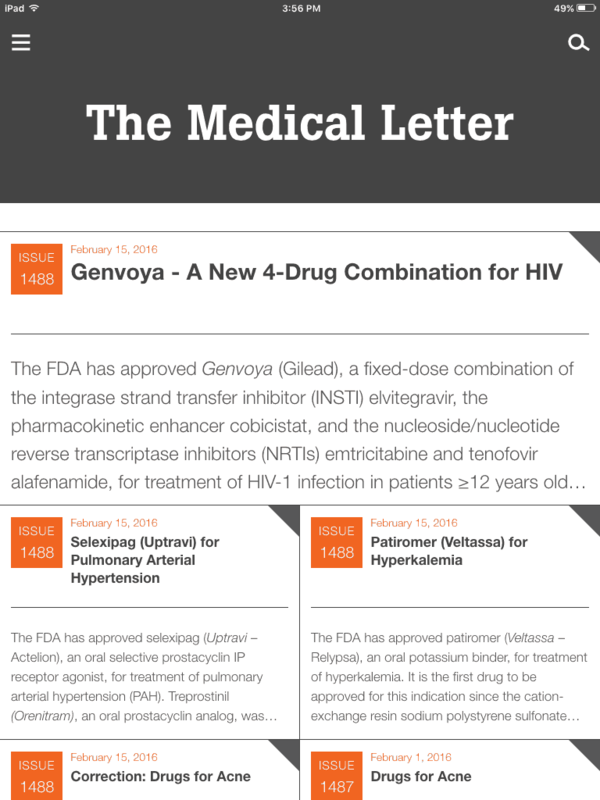 Content in the Medical Letter on Drugs and Therapeutics can also be accessed via the Medial Letter mobile app. Follow the steps below to install the app. Click the Mobile Apps link under Products on the left side of the screen. Fill in the registration form using your Iowa email to set up a password. Open the App Store on your mobile device, search for “the Medical Letter” and install at no charge. Log in with the password you created earlier. Questions? Comments? Email us at lib-hardin@uiowa.edu or call (319) 335-9151.
eLibrary by Proquest will be down for maintenance, beginning at 9pm Saturday, January 9. The system should return to service in 10 hours. If you click on an eLibrary resource during maintenance, you will be re-directed to a webpage explanation. If you can’t access a resource you need by Monday, January 11, please contact the Hardin Library for assistance. The Hardin Library subscribes to many clinical reference tools you can install on your mobile devices for free. 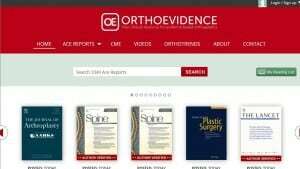 Hardin Library now subscribes to OrthoEvidenceTM, an international evidence summary tool designed for orthopedic clinicians. The collection contains over 3000 evidence reports (advanced clinical evidence or ACE) authored by experts in the field. ACETM reports are intended to help the busy practitioner to review the evidence from important journals efficiently to support sound clinical decision making. The database also contains educational videos about research methods and evidence-based practice. 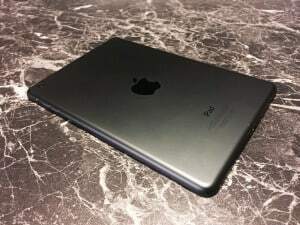 Mobile is available for iOS devices. To view directions for installation, visit the Hardin Library Mobile Devices guide (or http://guides.lib.uiowa.edu/mobile). Please contact your liaison librarian or the Hardin Library Reference desk with questions or problems with this or other resources. ScienceDirect’s Reference Module in Biomedical Sciences contains trusted, peer-reviewed, comprehensive content from ScienceDirect’s reference works as curated by an editorial board led by Editor-in-Chief, Michael Caplan. Valuable for interdisciplinary research, it is designed for faster, more relevant browsing within the subject and beyond, with featured articles for quick, clear overviews, subject hierarchies to put everything in context, and guidance to lead researchers to related knowledge. The trial runs until March 24, 2015. Please send comments to Janna Lawrence. The Hardin Library for the Health Sciences has access to Transplant Library through June 30, 2015. Searching the Transplant Library does not require special skills so it may be used by clinicians, researchers and other related health professionals in organ transplantation. If you have comments about Transplant Library, please send them to Janna Lawrence, Deputy Director, Hardin Library for the Health Sciences. ClinicalKey now works with v. 11 of Internet Explorer, as well as other browsers. Last week ClinicalKey was not working with IE 11 due to a Microsoft upgrade. 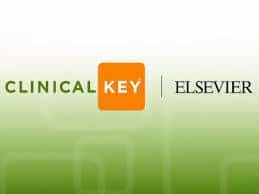 If you have trouble accessing ClinicalKey, please give us a call at 319-335-9151. Nutrition is a trending subject that’s important in many areas of the health sciences. Nutrition is one of the most difficult subjects to search in PubMed, because relevant aspects of the subject are scattered among multiple subject terms. We’re offering a class to help you optimize your searches for nutrition, diet and food in PubMed. The class is appropriate for all health sciences specialties. It will be taught by Janna Lawrence and Eric Rumsey, both of whom are experienced in searching nutrition and other subjects in PubMed. Questions? Contact us by calling (319) 335-9151 or email us at lib-hardin@uiowa.edu.